The Chough, a member of the crow family, is rarely seen in Britain except in Wales and parts of western England and Scotland. You are most likely to be able to observe the aerobatics of these intriguing birds above high cliffs and occasionally inland over craggy mountain areas. The Chough is a resident bird. Pairs of choughs often nest alone on rock ledges, although you may see flocks of twenty or more in the air. 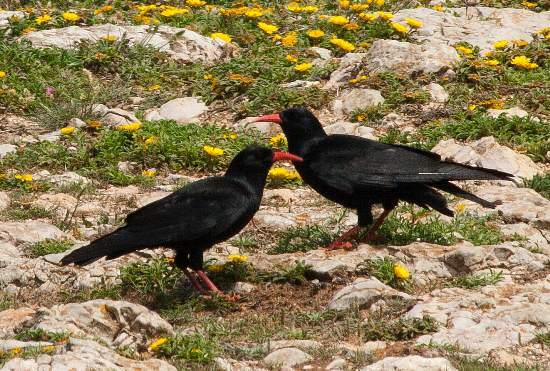 Male and female Choughs are similar in appearance. They both have all-black plumage and are much the same size as a jackdaw, with which they are sometimes mistaken when in flight, at which times the distinctive red legs and beak are often less clearly visible against the bright background of sky. 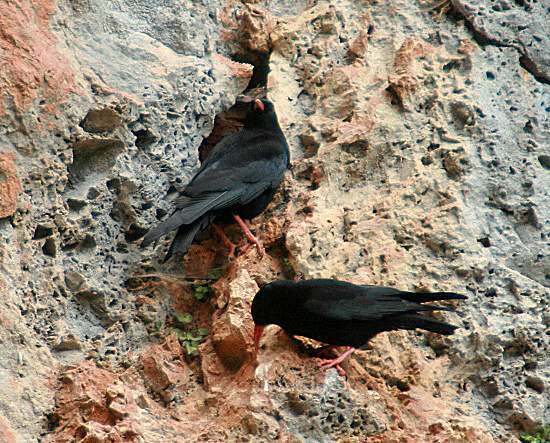 The Choughs seen above were nesting on the almost sheer face of a limestone cliff in Crete, where large colonies of these birds can be seen. As the limestone weathers, cracks and small caves appear on its exposed surfacse and these features provide ideal nesting sites for these rather shy and secretive birds. Acrobatic in flight, Choughs builds their nest from twigs, roots, mosses and other plant debris, sometimes bound together with mud, and lined with sheep's wool and other hair or fibrous materials that the pair can gather. Nest are often refurbished and reused in future years. The female lays and incubates three to five eggs, which take up to three weeks to hatch. While the young are fledging, the female looks after them while the male brings food (mainly small insects) to the nest. Once they can fly, the young Choughs soon learn to forage for food, but they usually stay with their parents until about three months old, at which time they leave to join a flock of other young birds. They remain in flocks until, at between two and four years of age, they are ready to breed for the first time; then they pair up and go off in search of a suitable nesting site either as solitary pairs or, less commonly in Britain, in small colonies. This page includes pictures kindly contributed by Rob Petley-Jones.